Priority Development Areas in the San Francisco Bay region overlap with communities with the highest health risk from toxic air contaminants, including diesel pollution from freight transport, designated as CARE zones by the Air District. But a new study from the Pacific Institute and the Ditching Dirty Diesel Collaboration found that 74% of the land in Priority Development Areas that intersect with CARE communities is far enough away from freight transport hazards to be suitable for sensitive land uses like new housing. With wise regional planning, decision-makers have the power to develop the region’s economic capacity while protecting the health of vulnerable communities. 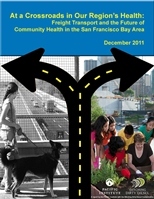 The new analysis, At a Crossroads in Our Region’s Health: Freight Transport and the Future of Community Health in the San Francisco Bay Area, maps the Priority Development Areas, with 45 detailed local maps of five Bay Area counties. These maps highlight the 26% of the land in CARE communities where it is inadvisable to site sensitive land uses like new housing. Within the significant remaining area, one out of every three acres is zoned as residential or mixed residential/commercial, providing planners great potential for reducing land-use conflicts between residential and freight-transport-related land uses. See Bay Area Maps and Maps by County below. Using mapping and spatial analysis, the new report assesses the current and potential conflicts that exist between freight-transport-related land uses and sensitive land uses such as housing, schools, parks, and health clinics in these areas. To determine which places are most impacted by freight-related land uses, the researchers generated health-protective buffers around freight-transport-related land uses including freeways, rail yards, seaports, airports, warehouses, and distribution centers. The report identifies how many sensitive land uses – such as schools, parks, and health clinics – are already located within these health-protective distances from freight-related land uses, and identifies the amount of residentially zoned land within these health-protective buffer zones to assess for future land-use conflicts. The Pacific Institute/Ditching Dirty Diesel report recommends that to minimize potential land use conflicts, available suitable land located at a health-protective distance from freight-related land uses should be prioritized for new housing and other sensitive land uses. The remaining land area located in close proximity to freight-related land uses can be prioritized for commercial and light industrial development that creates jobs for local residents while protecting worker health.